After a period of structural reforms, the Union Budget 2018-19 has taken into consideration the social sector, especially health and education. Hopes of children gaining priority in this year’s budget though remained unfulfilled. The total Budget for Children remains stagnant at 3.23% with Rs 79,088 crore allocated for children over last year’s allocation of Rs 71,305 crore (an 11 per cent increase). Overall allocation for school education and literacy did not increase as expected, given the task at hand. One of the key strategies announced by the Government is the perspective shift of considering the complete school cycle – from pre–primary education to Class 12. There are immense challenges in this journey in terms of infrastructure, teacher shortages and lack of training. 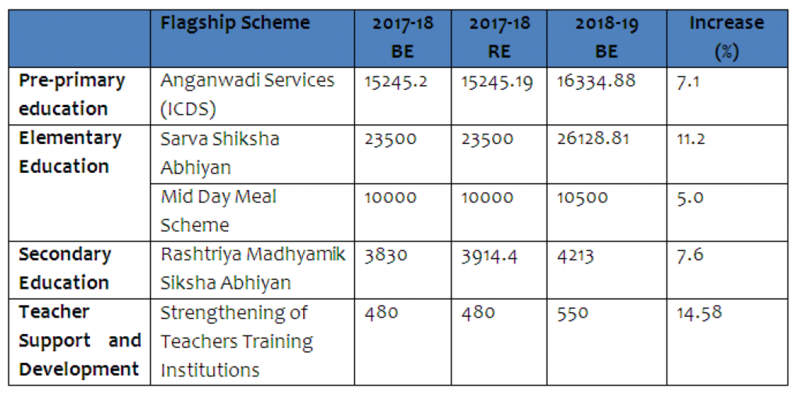 This will involve, at a minimum, convergence between key flagship schemes, including ICDS Anganwadi services, Sarva Shiksha Abhiyan (SSA), Mid–Day Meal (MDM) and Rashtriya Madhyamik Shiksha Abhiyan (RMSA). Looking at the fact that there is a need for improving quality of education and enhancing teaching-learning environment in classes, the increase in scheme allocations as indicated below may not be sufficient. A similar scenario is visible in the critical phase of young children below six years. The first few years of life are critical in preparing the foundation for child’s physical growth, development, and overall learning potential across life. The largest development scheme for children implemented through the Anganwadis has seen a 7 per cent increase over last year’s spending of Rs 15,245.19 crore (RE 2017-18) to Rs 16,334.88 crore (BE 2018-19). This scenario exists when Anganwadi Centres are yet to gain universal coverage. Considering the requirement of increased focus on pre-school education and care services for children below 6 years, this increase is insufficient in delivering services to our 165 million children in this age group. Critical too, is to get our strategies for malnutrition in place. India is still tackling malnutrition of children at a significant scale. The recently released survey results from National Family Health Survey-4 (2015-16) indicate a mixed bag of report in the context of nutritional status of children under 5. For instance, there is a gradual decline in child stunting (from 48 per cent in 2005-06 to 38.4 per cent in 2015-16) and underweight children (43 per cent in 2005-06 to 36 per cent in 2015-16). The National Nutrition Strategy was released by the NITI Aayog last year based on which the implementation of the National Nutrition Mission has received a boost from Rs 550 crore (RE 2017-18) to Rs 2,928.7 crore (BE 2018-19). Hope this increase helps bring children out of undernourishment and we quickly move towards ‘kuposhan mukt’ Bharat. Crucially missing in the budget is a response from the government in the area of Child Protection. For years, India has turned a blind eye towards the safety needs of its children. All forms of violence and abuse has been witnessed in recent times, including violence perpetrated by parents, teachers and even other children. The child protection system in India at present is highly reactive and symptomatic, responding only once a violation has already taken place and a child victimised. In addition, the design and provisions of laws are also structurally insufficient to ensure implementation. The allocations towards Integrated Child Protection Scheme (ICPS), the only scheme in India that addresses child protection increased by Rs 77 crore from Rs 648 crore (RE 2017-18) to Rs 725 crore (BE) which is a 12 per cent increase. In the present increase in allocations, there is no space for introducing efforts towards prevention and rehabilitation within the child protection continuum. 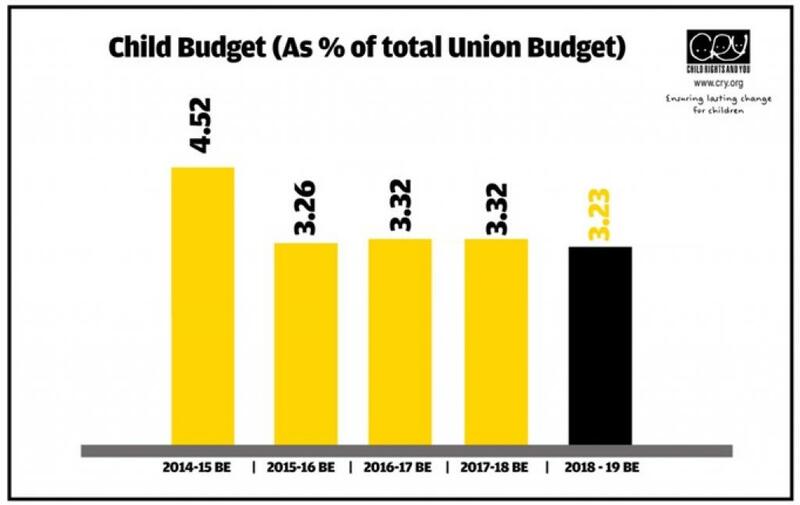 The overall composition of Budgets for Children, however, has essentially remained the same as seen in the graph below.